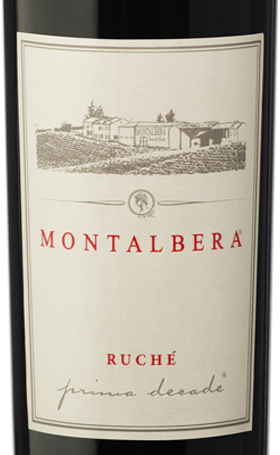 The First Decade by Montalbera is a vintage of Ruché di Castagnole Monferrato DOCG with unprecedented quality and longevity characteristics. Only 3733 bottles obtained from the harvest selection of the best grapes of the oldest and best-exposed vineyards of the company, packaged in a limited edition OLD bordolese bottle. THE WINE It's been 10 years since those first days of the 2003 harvest in which the baskets were filled with racks of grapes Ruchè, of which so little was known and of which it was decided nevertheless to become ambassadors all over the world. So much time has passed but, precisely for this reason, it was absolutely necessary to celebrate the tenth anniversary in an "unforgettable" way. What better choice than to produce one thousandth of Ruchè with unprecedented quality and longevity characteristics. Only 3733 bottles obtained from the selection in harvest of the best grapes of the oldest and best exposed vineyards of the company, packaged in a particular and very precious OLD bordering bottle in limited series as well as the precious wine it contains. Prima Decade wants to tell the ten years of a company, the daily work, the propositional effort and study of the territory, the obsessive search for quality, the deep belief in this indigenous Monferrato of Asti with unique and unrepeatable characteristics in the enological world. It thus becomes the emblem of an absolute and certified quality, the fulcrum of the longevity of this vine. The story just started ... THE COMPANY Morando family has its roots in the Langhe and this binding could not express himself in the vineyard and winery. Castiglione Tinella, place of origin of the founder Riccardo Enrico Morando, is home to about 15 hectares of vineyards planted with Moscato d'Asti. And it is from these vineyards that produce Montalbera Moscato d'Asti DOCG San Carlo which takes its name from the ancient church of San Carlo which is a few meters from the birthplace of the founder family. In the mid-eighties, the Morando family, adopting a policy of expansion not yet completed, with the acquisition of adjoining land and direct planting of new vineyards, mainly Ruchè. Today the company is surrounded by its own vineyards arranged in circular form one body entirely hilly position, with different exposures and soils ranging dall'argilloso of limestone. One of the features that have always distinguished Montalbera in the Piedmont landscape is that of being a horse actually between the two great wine regions of Piedmont: Monferrato and Langhe. The vineyards cover six full hills and on the valley floor space is the cultivation of typical Piedmontese hazelnut. The vineyards have ages varying from 7 to 30 years, the training system is the low Guyot and every agricultural operation is carried out by hand. 82 hectares are planted with Ruchè, corresponding to 60% of the entire denomination. The other varieties are planted Barbera d'Asti, Grignolino and Viognier. For generations the Morando family believes and invests in the Piedmontese viticulture and for years he has been passionately dedicated to the enhancement dell'autoctono Ruchè. 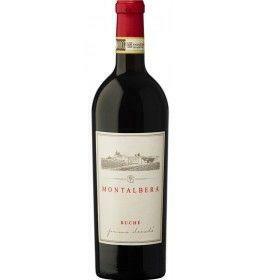 And thanks to this ongoing commitment, today Montalbera arises of law among the great wineries of Piedmont. The foundations of this success lie in strong values ​​and recognizable that translate very clearly in the wines produced. Rigor and planning. Interpretation and terroir. These are the basics of the production philosophy Montalbera. A thought that puts at the center of all the fruit wine, exalting the great peculiarities of the vineyards, interpreting the characteristics and declinandole in different ways, from steel to wood, from overripe withering, so make the most of the multi-faceted personality of each grape variety. RUCHE', the Red Prince of Monferrato We are facing an undeniable charm wine. Its origins unknown to most and his scent so special it clearly distinguished from the other Piedmontese wines making it exciting and unique. Ruchè of Castagnole Monferrato DOCG is a wine with unmistakable character; nice floral notes of rose and violet, fruity notes of apricot and spice emerging with developments make it immediately recognizable in the glass. One hypothesis is that it comes from " San Rocco ", a devout monks community to this saint, who introduced his cultivation in the area. Another thesis want that the name derives from the Piedmontese term " roche ", understood as variety grown in entrenched areas of Monferrato. The most accepted theory, however, is that the Ruchè comes from old vines of Haute-Savoie . What is certain is that in the Monferrato this variety has found its land of maximum qualitative expression election. Before 37,65 € tax incl. Tasting Color: ruby red. Bouqhet: intense, persistent with hints of fruit in syrup and cooked plums, vanilla and honey. 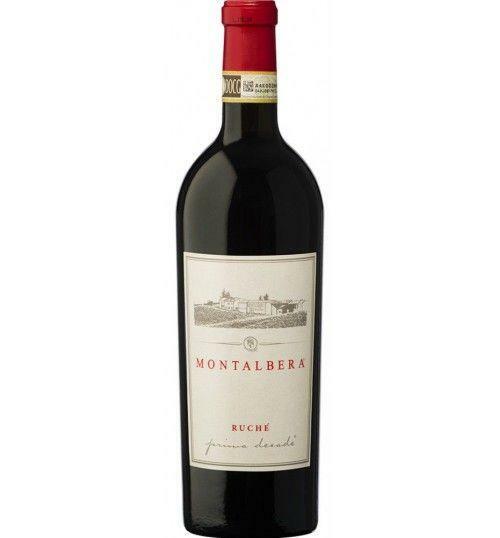 Taste: full-bodied, dry, robust and pleasantly tannic, with excellent balance and harmony. It's been 10 years since those first days of the 2003 harvest in which the baskets were filled with racks of grapes Ruchè, of which so little was known and of which it was decided nevertheless to become ambassadors all over the world. So much time has passed but, precisely for this reason, it was absolutely necessary to celebrate the tenth anniversary in an "unforgettable" way. What better choice than to produce one thousandth of Ruchè with unprecedented quality and longevity characteristics. Only 3733 bottles obtained from the selection in harvest of the best grapes of the oldest and best exposed vineyards of the company, packaged in a particular and very precious OLD bordering bottle in limited series as well as the precious wine it contains. Prima Decade wants to tell the ten years of a company, the daily work, the propositional effort and study of the territory, the obsessive search for quality, the deep belief in this indigenous Monferrato of Asti with unique and unrepeatable characteristics in the enological world. It thus becomes the emblem of an absolute and certified quality, the fulcrum of the longevity of this vine. Morando family has its roots in the Langhe and this binding could not express himself in the vineyard and winery. Castiglione Tinella, place of origin of the founder Riccardo Enrico Morando, is home to about 15 hectares of vineyards planted with Moscato d'Asti. And it is from these vineyards that produce Montalbera Moscato d'Asti DOCG San Carlo which takes its name from the ancient church of San Carlo which is a few meters from the birthplace of the founder family. In the mid-eighties, the Morando family, adopting a policy of expansion not yet completed, with the acquisition of adjoining land and direct planting of new vineyards, mainly Ruchè. Today the company is surrounded by its own vineyards arranged in circular form one body entirely hilly position, with different exposures and soils ranging dall'argilloso of limestone. One of the features that have always distinguished Montalbera in the Piedmont landscape is that of being a horse actually between the two great wine regions of Piedmont: Monferrato and Langhe. The vineyards cover six full hills and on the valley floor space is the cultivation of typical Piedmontese hazelnut. The vineyards have ages varying from 7 to 30 years, the training system is the low Guyot and every agricultural operation is carried out by hand. 82 hectares are planted with Ruchè, corresponding to 60% of the entire denomination. The other varieties are planted Barbera d'Asti, Grignolino and Viognier. For generations the Morando family believes and invests in the Piedmontese viticulture and for years he has been passionately dedicated to the enhancement dell'autoctono Ruchè. And thanks to this ongoing commitment, today Montalbera arises of law among the great wineries of Piedmont. The foundations of this success lie in strong values ​​and recognizable that translate very clearly in the wines produced. Rigor and planning. Interpretation and terroir. These are the basics of the production philosophy Montalbera. A thought that puts at the center of all the fruit wine, exalting the great peculiarities of the vineyards, interpreting the characteristics and declinandole in different ways, from steel to wood, from overripe withering, so make the most of the multi-faceted personality of each grape variety. We are facing an undeniable charm wine. Its origins unknown to most and his scent so special it clearly distinguished from the other Piedmontese wines making it exciting and unique. Ruchè of Castagnole Monferrato DOCG is a wine with unmistakable character; nice floral notes of rose and violet, fruity notes of apricot and spice emerging with developments make it immediately recognizable in the glass. One hypothesis is that it comes from "San Rocco", a devout monks community to this saint, who introduced his cultivation in the area. Another thesis want that the name derives from the Piedmontese term "roche", understood as variety grown in entrenched areas of Monferrato. The most accepted theory, however, is that the Ruchè comes from old vines of Haute-Savoie. What is certain is that in the Monferrato this variety has found its land of maximum qualitative expression election.